When healthy aging is the research goal, scientists benefit from a tenacious mindset. For one researcher, that’s not a problem. Nearly 30 years ago Mayo’s endocrinology division decided to hire a basic scientist named Cheryl Conover, Ph.D., to underpin their clinical research. And now she’s using what she found in the lab to suggest solutions to age-related diseases in the clinic. When she started, Dr. Conover, says, “these clinicians reached out to me and that impressed me.” As a new investigator at Mayo one of her first projects was looking at insulin like growth factors (IGF) which are similar in structure to insulin and help cells grow. Cheryl Conover, Ph.D., endocrinology researcher and the George M. and Edna B. Endicott Professor of Medicine (center) and her lab on the St Marys campus in Rochester, Minnesota. They are important for regulating cell division, migration, survival and the way one cell changes into a more specialized cell. Dr. Conover and her team were looking at IGFs and their involvement in the work of a wound-healing cell, called a fibroblast. They were looking specifically at how a group of binding proteins controlled the actions of the IGFs. As they prepared to publish some of their findings, a reviewer requested an additional test. “We thought the reviewer’s suggestion was ridiculous,” Dr. Conover says. But they did the experiment, and when they checked the cells, the researchers got a shock. One of the binding proteins had disappeared. “I said, ‘Whoa, what’s going on here,’ and we tried to find out,” Dr. Conover says. But federal funders weren’t convinced the research was a good bet. So, like any enterprising researcher, she turned to others for support. With Mayo funding, Dr. Conover found a skilled biochemistry postdoctoral fellow, Jim Lawrence, who could navigate the high peaks of chromatography. “This was a three-year project where he tried over a hundred different techniques,” says Dr. Conover. And in the end, they did it. The team identified the cause. It was a protein associated with pregnancy that had broken down the missing protein. “Our next question was what is this pregnancy protein doing in human fibroblasts,” Dr. Conover says. Pregnancy-associated plasma protein A, abbreviated to PAPP-A, had been discovered in 1974 and is one of four proteins at high concentrations in the plasma of pregnant women. It was used as a development marker for the fetus in the first trimester but, Dr. Conover says, no one knew the specific function of the protein. After some research, they did discover that a Mayo colleague working with a visiting researcher from Denmark named Claus Oxvig, Ph.D., had published papers on PAPP-A. That lab had developed a way to tag the protein, but they still didn’t know what it did. So the groups combined forces. Together, they published research showing that PAPP-A regulates the growth promotion properties of IGF. With that knowledge came another vital piece of information, says Dr. Conover. “The cell culture studies showed, yes, indeed, that PAPP-A regulates IGF growth-promoting activities, but while that activity is positive in early life, it’s actually negative later in life,” she says. Growth factors early in life help a fetus develop, she explains. But these factors must be modulated precisely. PAPP-A is just one part of the complex process: It stimulates the growth factors, but it, in turn, is inhibited so that growth can be fine-tuned. 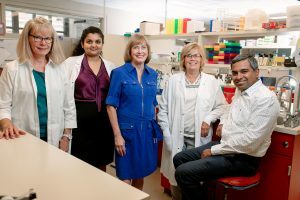 In cases other than pregnancy, the team’s research shows that high PAPP-A activity can be associated with cancer, aging and metabolic disease. To this point, the researchers had been working in cell cultures. Now, what they needed was a more complex model, like a mouse. But Dr. Conover had no experience in developing a mouse model. 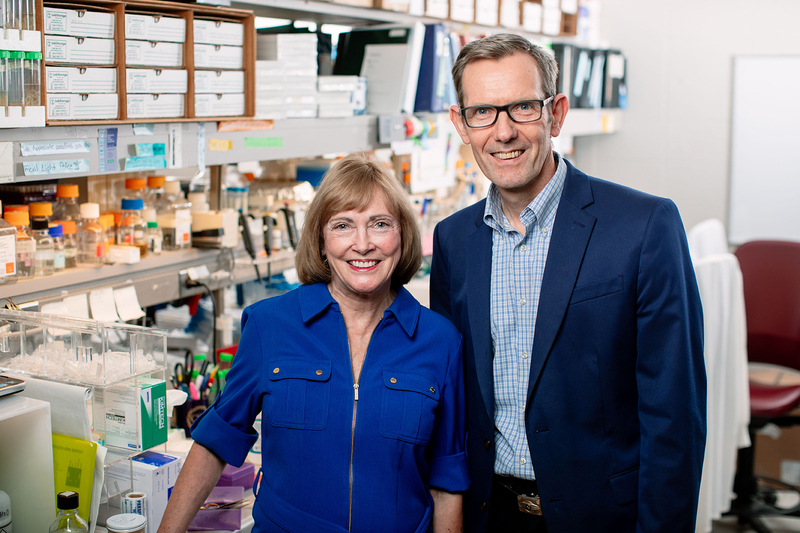 Cheryl Conover, Ph.D., endocrinology researcher and the George M. and Edna B. Endicott Professor of Medicine; and Jan van Deursen, Ph.D., a Mayo Clinic cancer biologist and the Vita Valley Professor of Cellular Senescence. “I decided to take an unofficial sabbatical in the lab of Jan van Deursen,” says Dr. Conover, because of his expertise in animal models. With the support and approval of the endocrinology division, Dr. Conover took this unusual step and divvied up her responsibilities to willing colleagues. 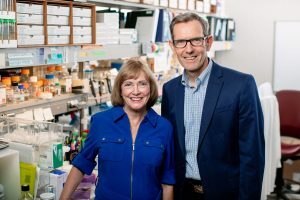 She headed downtown from her lab on the Mayo Clinic Saint Marys Campus, in Rochester, Minnesota, to the Guggenheim lab of Jan van Deursen, Ph.D., a Mayo Clinic cancer biologist and the Vita Valley Professor of Cellular Senescence. 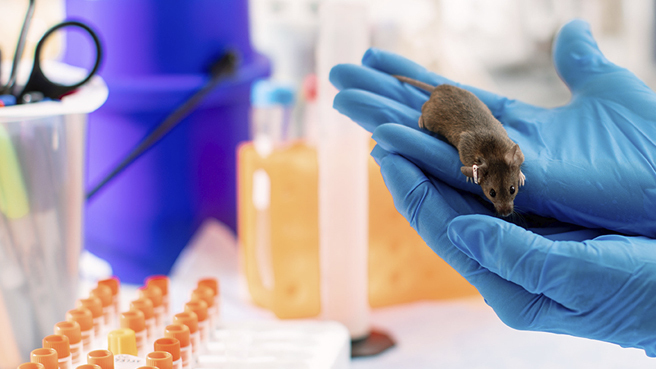 Despite long odds, Dr. Conover wanted to move the PAPP-A finding forward by developing a mouse without the gene to make PAPP-A (called a knockout) in a way that could be seen (called a phenotype). She fulfilled the role of a graduate student to a T, says Dr. van Deursen. “Cheryl lacked pertinent technical skills and experience in genetic engineering when she joined the lab, but her persistence and determination to succeed outside of her comfort zone was truly inspiring and key to the transformative discoveries that followed,” he says. 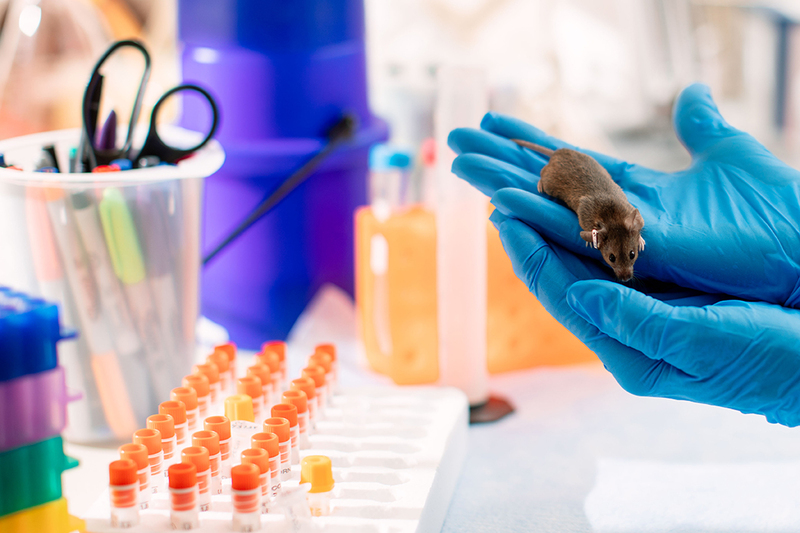 After over a year of work, with the guidance of Dr. van Deursen and his lab ─ “There were so many people helping me; they were so helpful,” adds Dr. Conover ─ the team succeeded in developing a PAPP-A knockout mouse model. The mice were smaller than normal, explains Dr. Conover, because PAPP-A is needed to fully turn on the IGFs that drive optimal fetal development. But the model worked. And the first thing the team reported is that the no -PAPP-A mice lived longer than their normal littermates. This allowed the team to start translating the PAPP-A theories into humans. In one example, Dr. Conover and team worked with clinical colleagues to examine the artery-narrowing buildup called plaque that is a hallmark of atherosclerosis. Like many ailments of aging, atherosclerosis can be a relentless killer. By pursuing the secrets of PAPP-A, Dr. Conover hopes that her basic research can lead to advances for patients. Because aging is the one risk factor humans can’t avoid. Certainly, there’s still a long road ahead to turn the PAPP-A research into a therapeutic or preventative agent, she says. However, Dr. Conover, in true form, persists in looking at the horizon of PAPP-A research.